Meet some of our Eldritch tribe…..
Laetitia danced with Border Morris team Wolf’s Head & Vixen Morris in Kent from 1999. During her final year she held the position of Foreperson teaching Vixen Morris dances. 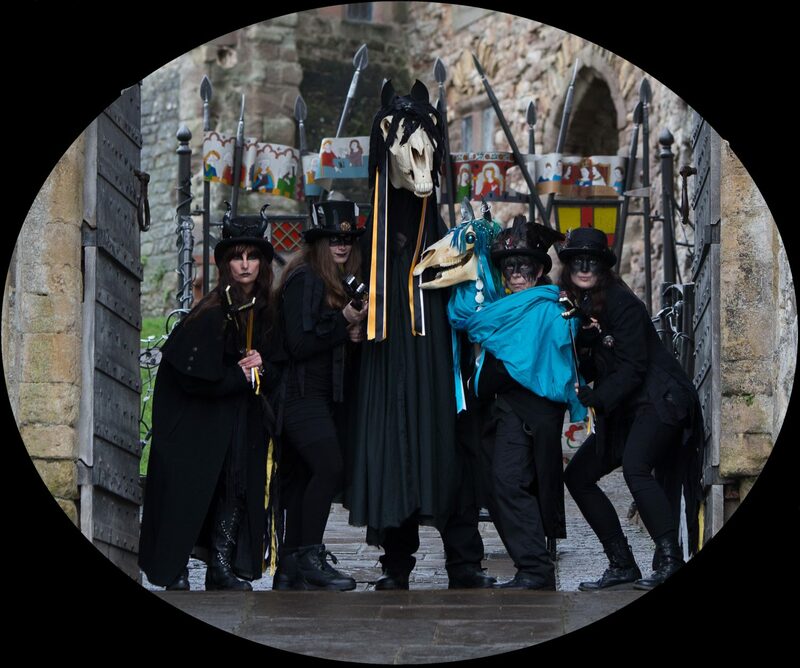 She trained with Cassandra as ‘Oss Teazer since 2009 and it was at Chepstow Wassail in January 2017 that Cassandra handed over her ‘snapper’ and the position of Teazer. Laetitia has choreographed dances for the ‘Oss and Teazers and also rides her ‘Oss Morvargh, who appears alongside Penkevyll or when she is not available. Cassandra brings to the team 20 years experience of ‘Obby ‘Oss teazing and has a background in community theatre. She is a Dartington Honours Graduate and her profession is Wisewoman of St Buryan. She is a recent author of a book published by Mandrake of Oxford. See her Website for more details. Following her retirement in 2010 Cassandra started to learn to Morris dance at the age of 61! She lives in her traditional Cornish 200 yr old cottage with Laetitia. She also loves a pint of good cider. If any male misbehaves they receive the “genital shriveling look” which has brought men to their knees! Laetitia’s Apprentice Teazer is in her 30s and we have known her for some time. She understands the energy of the ‘Osses and the importance of good performance and detail. We look forward to seeing her progression. She is also a talented tattoo artist and has an inquiring mind. Sally is in her 40s and is an accountant. She has history in dancing and is also enthusiastic about Tai Chi. Sally enjoys her new life as Teazer, loves the anarchic energy and is also a wild party animal who introduced Laetitia to Tarquins Gin! She has an infectious cackle that can be heard for miles! We now have 3 male ‘Oss riders and have decided to keep their anonymity retaining the mystery and intrigue of Penkevyll. They are talented with their own unique interpretation of working with the ‘Oss hence each performance will be different. Rhys was an ‘Oss Rider since December 2009 (riding Penglaz) – March 2014 (riding Penkevyll) he first performed at 17 years of age. He has a rich history of performance experience including musicianship (piano, saxophone and vocals), Morris dance, theatre, entertainment, martial art demonstration and devising/choreography of dance and drama. He also performs as a fire dancer. He joined a Border Morris team from the age of 7 and has devised some of the dances we used with the Boekka’s former Morris team. He has an Honours Degree in Theatre Performance which he attained at University College Falmouth and belongs in a variety of community projects. Rhys has worked for the BBC and now works as an Entertainments Organizer in various holiday resorts. His talents as a rider, dancer, choreographer and composer are missed as he was a real asset to our team. We also thank ALL former members for the effort and performance they contributed during their time with Boekka.